Showing results for tags ' king'. I have a 2005 king quad 700 that won"t start.its getting plenty of fuel and spark.The last time it started it back fired and quit.hasn"t started since.Any ideas whats wrong? Feul pump went out. Replaced. At times quad cuts out like its not getting gas. Saw article on new pump needs to be calibrated. Told how to go into a service mode. Does not tell how to calibrate after going into mode. Can anyone shed light on this procedure. 1994 King Quad with tracks? Can you put tracks on manual atvs? would it be effective? is 280cc enough to even move them? thoughts/suggestions? 700 king quad rebuild or replace engine? I recently picked up a king quad 700 that doesn't run in the hopes of getting it running by spring. It had been previously taken apart some and a few pieces are missing in the engine, but the frame is complete and in good condition. The motor will need a piston, rings, cylinder, cams, and a few misc parts that are missing. Also the cases will need to be split to remove the pieces of piston that are in the crankcase. The piston blew up at high rpm and did a number on the cylinder so I'm trying to find out if it would be worth rebuilding this motor it buying another engine to swap in. There may be more damage to this engine that I can see so I was wondering how bad the insides of it could be considering it destroyed the piston. I have found a motor for 1200 plus 200 shipping, the only problem is I don't have that much now and I would have to save up a while before being able to afford it. Any suggestions appreciated. 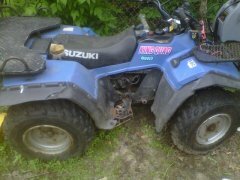 2009 Suzuki King Quad 750 - Help! okay so just recently I bought this machine for a friend's son as a graduation gift. We rode about two days ago and while riding he punctured the oil filter so we went home immediately. I fixed the oil leak and basically did an oil change and went out for a test ride to see how it was riding and about an hour into my ride it started shaking hard when I hit throttle and just rolled to a stop and now it will Not move in any gear. Out of one of the snorkels had a nasty burnt smell when this happened. Thank you for any help in advance!! I hope this is right form is not point me the right place. I have just brought a 07 king quad 700. Its got 14 rims with 28 tires. Can't remember what brand right now. What I would like is a programmer and a clutch kit for it. I'm used to diesel trucks really new to the fuel injected quads. Let me know what my bike needs thanks. I recently aquired a king quad 700. I have changed oil spark plugs and air filter. My question is what could be the cause for oil to be burnt through exhaust? Smoke is blue in color and smells of oil. Bike runs good no loss of power just blows a good bit of smoke after reaching operating temps. Didn't smoke until reaching temperature. Thanks for any input you may have. 1991 King Quad slide has holes in it? Hi, I have a 1991 King Quad that I bought that needed "carb work". So I bought a rebuild kit and installed it, checked and set float height. It idles okay, but when I give it gas it stumbles all over itself. On full throttle it suddenly comes alive and pulls and pulls. It is rideable, but only marginally. So I was examining the slide and diaphragm, but at the bottom of the slide, there are three holes. One in the middle for the needle, and two on each side of it at the bottom of the slide. What are these holes for? I can see daylight through them so no vacuum is being formed in there, it is being sucked out of the two open holes. Is there a spacer or something that blocks these holes? I might try filling them with silicone and seeing how it runs with it in there, because it is not running right right now. It acts lie there' no vacuum pulling the slide up, only at WOT. when it has been threw deep water and then sets in freezing weather, the right front wheel locks up, can get it loose by putting it in four wheel to break it loose then off tot he trails but any idea where t look for the cause or the leak that is causing it to lock up must be getting water in somewhere on the break drum i think that it shouldnt.. any help would be appreciated..
Whiskey_Bravo posted a topic in New Members Area! New Guy here, 38 Yrs old Soon to be retired US Marine. Lives in Frankfort Maine USA. I have a 2009 Honda trx500fa9, I bought when I was wounded to get around. I love it, Been on serious over nighters with it. recently joined my local ATV Club..very cool! I bought a father son project- not going soo well, needs lots of help and advice- 1993 Suzuki LT-F4WDX P KING QUAD I posted my first thread about it in manufacture specific area- read the best i can to see similar issues..?? anyways- glad to be here, and anything i can share for help or guidance , just let me know.